The English Rose quilt block is a five patch block that, for once, I actually sewed together in 5 rows of 5. Usually, I try to find a way to make five patch blocks as uneven nine patch blocks, as I find that often offers an easier method for sewing. However, due to the colour arrangement of the individual patches, sewing it together in rows was a better choice. 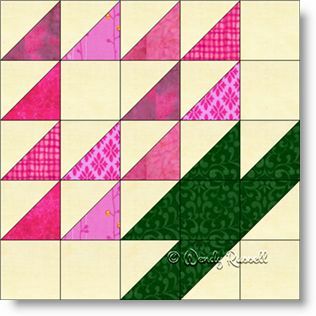 The block is comprised entirely of patches that are the two most common in quiltmaking -- the square and the half square triangle. Since this block is set on point itself, it yields many opportunities to rotate and flip the blocks to create secondary patterns. You can see what I mean by checking out the two sample quilts illustrated below.